Our team spanning Human Emotion Systems laboratory, University of Tampere, and Aalto University has revealed how subjective feelings are organised in the human consciousness. Subjective feelings are a central feature of human life. We constantly experience an ever-changing stream of feelings that is only abolished during sleep, brain damage, and deep unconsciousness. It is however most puzzling how we organise our inner mental lives. 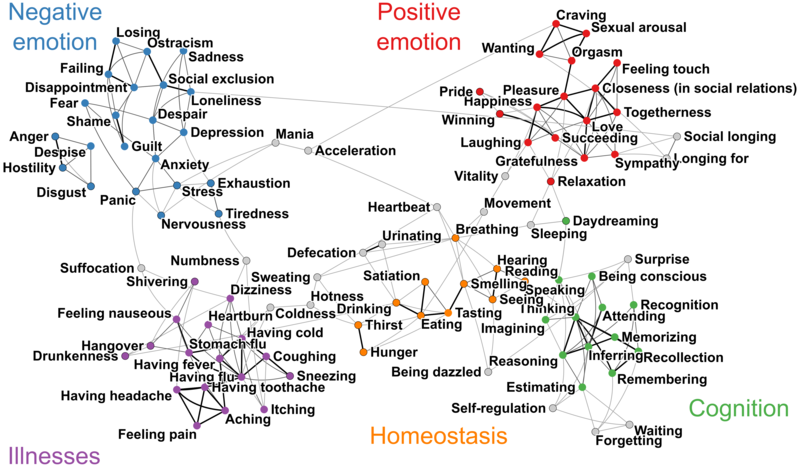 Our new research shows how such subjective feelings are organised into five groups: positive emotions, negative emotions, cognitive operations, homeostatic functions, and sensations of illness. All these feelings are coupled with strong bodily feelings. This page provides a lay summary and additional information on the study originally published in Proceedings of The National Academy of the United States of America. You may read the full paper here. How the study was done? 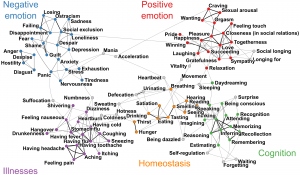 The study was conducted as an Internet-based survey, whose results were used to generated maps of 100 common feelings covering, for example, emotions, cognition, homeostatic processes, and illnesses. Over 1000 adults took part in the experiments. They evaluated how strongly they experience different feelings in the mind and the body, and how pleasant and controllable each feeling was. Next, the participants were shown with the full list of 100 feelings, and were asked to arrange them into a grid so that similar feelings would be close and different feelings away from each other. Finally, participants were shown pictures of blank human bodies, and asked, for each feeling, to colour the regions where they experience changes during each feeling. Mapping the feeling space. You may download a larger version of the image by clicking here. The program code used for acquiring the data can be this link. The complete dataset acquired in the study can be downloaded here. Based on the similarity ratings we generated a map of human feelings. In this map, the feelings that are experienced as similar to each other are also close to each other, whereas those that feel dissimilar are distant. The feelings form five discrete groups (clusters): positive emotions, negative emotions, cognition, homeostatic states, and illnesses. This grouping is likely based on the way the brain parses and combines the signals coming from the external environment and the body. Map of human feelings. You can zoom the image by hovering the pointer over it. A high-resolution version is available for download here. All feelings were associated with a unique bodily “fingerprint”. 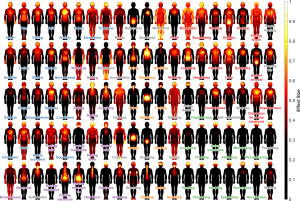 These were obtained by asking subjects to colour on blank human body figures the regions where they experienced each feeling. The resulting maps were then averaged across participants for each feeling. 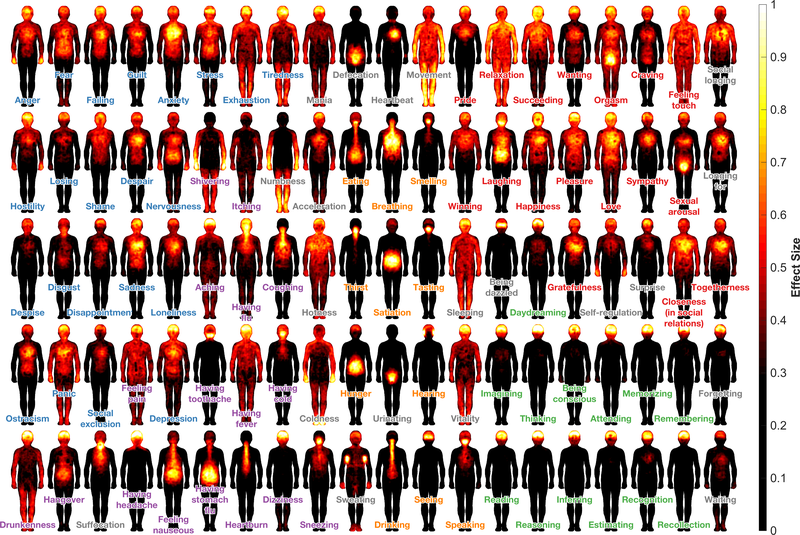 The resulting bodily maps are remarkably distinct across feelings, except for those associated with higher mental functions such as thinking and reasoning. Strong bodily signatures for feelings suggests that bodily processes are an important determinant of subjective feelings in general. Bodily basis of feelings. You can zoom the image by hovering the pointer over it. A high-resolution version is available for download here. The subjects also evaluated basic properties of all the feeling states: how saliently they are felt in the mind and the body, how pleasant and controllable they are, and how much time has passed since they last experienced each feeling. The table below shows the average ratings obtained in the study. The feelings are arranged based on their pleasantness, but you can rearrange the list by clicking on the column headers.